Little Wing Autogyro in flight. Thanks to Ron Herron for the use of this photograph. The Little Wing Autogyro is a unique design that actually took the gyroplane back to its roots. 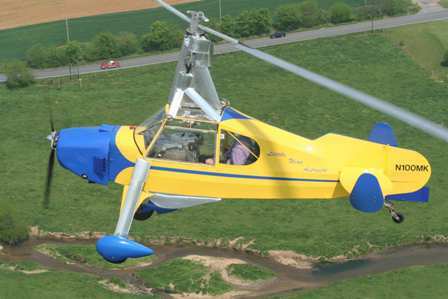 The Little Wing design was the first established gyroplane design to use a tractor configured engine arrangement since Kellet had closed its production of autogiros. Why in almost fifty years would a design all of a sudden revert back to a design as the gyroplane had been originally introduced? This is what makes the Little Wing design stand out as a “Historic Gyroplane”. Ron Herron, who got involved in sport gyroplanes in 1975 with a Bensen Gyrocopter, had become concerned about longitudinal stability and the increasing hazards pilots were facing with Pilot-Induced-Oscillation (PIO) and power pushovers (otherwise known as bunting). Herron was on a quest to develop an autogiro that would eliminate the unwanted possibility of entering a power push over scenario. Ron began researching why the newer designs were entering power pushovers and looked back in history to investigate if the original designs encountered these same issues. So using the Cierva designs as inspiration, Herron set about a prototype design using an old Piper airframe to build around. This design became the LW-1 and was used as a proof of concept model to verify flight control stability issues. This airframe was rather large and the rotor a bit too small for the aerodynamic performance that the builders were seeking but the design did show that Ron and his team were on the right track. Here again is a reason for the Little Wing design to be regarded as a landmark design in sport gyroplanes. Safety, this design was the first technologically challenging attempt to confront issues with center line of thrust and center of gravity location into account since the autogiro was first invented by Juan de la Cierva so long ago, in a tractor configuration. From the LW-1 a new, smaller version, was developed called the LW-2. Unfortunately, the added weight of paint and fabric took the total weight over the limit for certification as an ultralight but the design was well received and the team took the lessons learned from the LW-2 to make another design the LW-3. Almost stranger than fiction the Little Wing aircraft can be built for about the same cost as what the first Cierva Autogiros were selling for back in the late 20’s and early thirties. 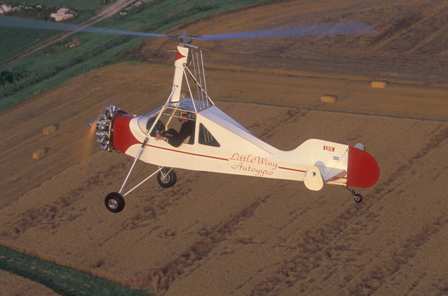 Many of the same innovations and modifications that Cierva and Pitcairn developed for their certificated designs can be found in the Little Wing design. A classic look with modern design and safety features has made the Little Wing worthy of recognition. The LW-2 and LW-3 are single place aircraft with a fuselage length of 16 feet for the “short versions” and 18 feet for the standard version, still made from a welded tubular steel airframe. Build of this design is from plans and a probable reason the design has not seen greater sales success because it is not offered in a kit form. The most famous of these designs is the model LW-5 in a gyroplane named for Snoopy’s best pal. Little Wing models LW-3, LW-4 and LW-2. Thanks to Ron Herron for the providing the Little Wing photographs. 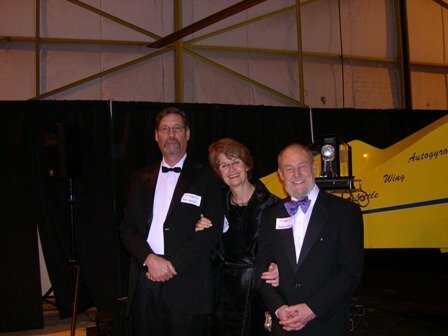 Andy Keech has flown a LW-5 autogyro for 29 recognized world records, in addition setting three Trans-continental speed records, many of which had been previously held by Ken Wallis and Igor Bensen. A true showing of pilot and aircraft to be mentioned among this fine group of individuals. Over a five-year period the Herron/Keech team worked hard to develop and bring to the air a Little Wing autogyro that was christened “Woodstock”. Woodstock was painted bright yellow and so named for Snoopy’s little yellow-feathered friend in the Charles Schultz comic strip “Charlie Brown”. Keech had a little yellow feathered friend of his own as he and “Woodstock” would journey down a path into the aviation records history books all starting in October of 2003. On a fall day in 2003, veteran parachutist, photographer, and multi-rated pilot Andy Keech climbed into the small, lightweight gyroplane and set out on a Trans-continental flight across the United States and back again. The flight set three Trans-continental speed records. Little “Woodstock” and Keech were just getting warmed up for their next endeavor to set another record. February of 2004, Keech again at the controls of the LW-5 would set a new world (straight line) distance record of 617 miles. This record was increased to 633miles in 2006, and finally to 879 miles in 2007. There were also improvements on the closed circuit distance, eventually out to 702 miles. May 2004, Andy takes “Woodstock" to new heights by setting new altitude (26,408 ft.) and time to climb world records. He later set new altitude records in the heavy sub class (over ½ ton) to 14,426” in 2006, and then to 16,279’ in 2007. The LW-5 is the only gyroplane to ever hold all four performance world class records at a single time for speed, distance, climb and altitude and only the second aircraft to do so. It is the only aircraft of any kind to set world records in those four performances on a single flight, ever. 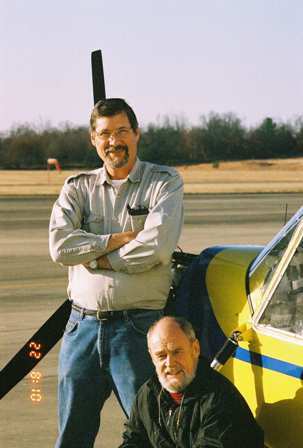 For these achievements Andy Keech was selected as the 2004 Wiley Post Spirit Award (WPSA) recipient and the honors bestowed at a banquet on January 28, 2005. L-R, Ron Herron, Marie Keech, Andy Keech and "Woodstock" at WPSA reception. Photograph contributed by Ron Herron. The following excerpt is quoted with permission from Andy Keechs “Woodstock’s” New Nest”. The entire article can be viewed at www.taxi-strip.com/AndyKeech. 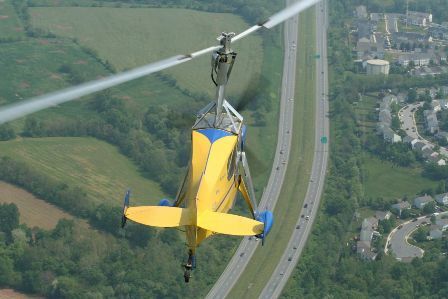 July 2003, at the 41st Annual International Convention of the Popular Rotorcraft Association, Ron Herron was awarded the “Best New Component Award” and the coveted “Grand Champion Gyroplane Award”. “Woodstock” was donated by Keech to the EAA AirVenture Museum in 2007. Oshkosh 2002, Ron made a trip to EAA Airventure with a potential to see a dream of his be born. The Rotec Engine Company of Australia brought five new engines to the show and a small kit airplane with an engine mounted on it for flight demonstration. The new engine was the Rotec 2800; a 2800 cc seven-cylinder radial engine. Knowing that the classic styling of his gyroplane would really look like a 30’s period autogyro with the radial, Herron bought one of the five engines brought to the show and set about work to install it on his existing LW-3 aircraft. Ron fabricated a new engine mount, firewall arrangement, oil tank and later cowlings and an exhaust collector ring. The results were impressive, an aircraft that not only looked like the classic autogire of old with great handling characteristics but also, now, one that sounded like an aircraft of the period. It was for this aircraft that Ron received the PRA Awards mentioned above. Little Wing Autogyro with Rotec 2800 radial engine. Thanks to Ron Herron for contributing this photograph. Thanks to Art Spink, Sydney Australia for use of this video. Ron Herron's innovative thinking of going back to the roots of gyroplane development for answers in stability and performance has opened many people’s eyes to the benefits that the original tractor style of design offers. There can be little argument over the performance capabilities of the design; the Little Wing has proven time and again what it can do. From the research and design aspect of things, I would think it is fair to say that Herron has proven the benefits of centerline of thrust and center of gravity location and stabilizer arrangement. What would really be interesting from a design aspect as well would be if NASA would compare the Little Wing flight characteristics and performance with that of EAA’s Pitcairn Autogyro. If the data was close enough to the Pitcairn design a far more affordable option for future testing of tractor designed autogyros could be done with the Little Wing design. The Air Force had spent a fair amount of research into the Bensen Gyro-Copter and its application for military use in a specific role. The means and standards of safety have changed over the past seventy or so plus years since the days of Pitcairn. If for no other reason than to collect new data to verify the old it would seem the Little Wing has a lot to offer the engineers for a very reasonable price. Any additional research and data it would be of valuable importance for future development and research on gyroplane design and stability. How can an industry move forward without collecting data that can be readily gathered? Thanks Ron Herron for opening our eyes. Video link provided by aero-tv.net. Photgraph contributed by Andy Keech. 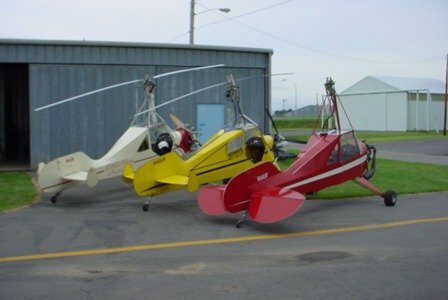 Little Wing Autogyro began its remarkable rise to fame based on Herron’s first two prototype gyroplanes. The prototypes used elevators to control pitch control and rotor control provided for lateral control. The rotor mast or pylon was mounted on isolation mounts to further reduce rotor vibrations to the airframe and flight controls, an arrangement of Ron’s own design. Using a Piper fuselage for the basic airframe the associated components were mounted and the LW-1 was born as the initial prototype. Following testing of the LW-1, Herron and his small team set about designing an ultralight version of the LW-1. The second prototype was to be called the LW-2 and was built within a very short two-month period. From concept to a fully assembled aircraft in two months! The LW-2 sported a strong 4130 steel tube frame and was powered with a McCulloch (target drone) engine. Due to concern over the engine selection Ron later replaced the McCulloch engine with a 70-hp AMW engine and brought the aircraft with this arrangement to both the PRA Intl. Convention and Oshkosh from 95-97. 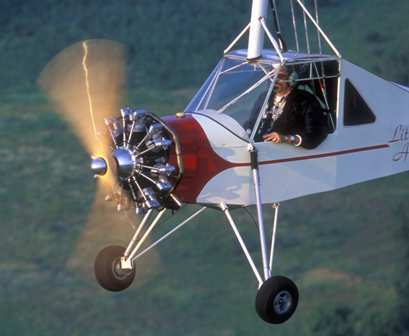 With the aircraft covered, painted and a new heavier engine, the LW-2 had exceeded the design goal of being in the ultralight category but the aircraft was proving to be very reliable and stable. Seeking to incorporate a fully tilting rotor into the design for added ground control of the rotor in windy conditions led to the idea of creating the next design, the LW-3. The LW-3 was modified in several other areas as well including removal of the elevators now that the rotor was now fully controllable. A new damper isolation system for the pylon, a new engine, ground rotor position lock and a design change to the landing gear all found their way into the new design. The LW-3 was to become the basic stable for the Little Wing fleet. From the start of a three-person endeavor of preventing PIO and power push-over accidents, the Little Wing Autogyro Company was formed. Over the past few years’ short versions and two-place models have also been offered as well as newer engine options such as the radial version described previously. The latest version of the Little Wing family of gyroplanes is the LW-5. Little Wing has had the reputation of outstanding customer support and continues to provide plans and prefabricated airframes for those interested in building a little friend of their own. Ron Herron and Andy Keech. Picture provided by Ron Herron. My great thanks to Ron Herron and Andy Keech for proof reading and contributing to this page personally. Working with these men has been a true pleasure their input was well recieved and written into the version you now see. What was interesting for me writing this page was each stuck to their own specialty. Ron with the company and Andy with the records. What neither could see was how each made sure that the other was recognized properly for their achievements, yet both wanted to ensure that the facts and accomplishments of what the Little Wing Autogyro has demonstrated was accurately documented. Each choosing to recognize a historic aircraft above their own personal achievements that got them there. It really was a pleasure working with you both. Photograph contributed by Andy Keech. Special thanks to Art Spink: Gyro News; Sydney, Australia, for providing the Little Wing video. Pictures Provided by: Ron Herron and Andy Keech. The Little Wing Logo is a trademark of the Little Wing Autogyro Company and all rights and usage of this logo belong to Little Wing Autogyro.